This list is adapted in part from U.S.A. and Canadian Red Cross material. · Be knowledgeable of the water environment you are in and its potential hazards, such as deep and shallow areas, currents, depth changes, obstructions and where the entry and exit points are located. The more informed you are, the more aware you will be of hazards and safe practices. ·Pay attention to local weather conditions and forecasts. Stop swimming at the first indication of bad weather, especially at the first sound of thunder or sight of lightning. Do not reenter the pool, lake, etc. until thirty minutes after the last sound of thunder or sight of lightning. ·	Enter feet first (with bent knees and flat feet) at all times unless you are very familiar with the swimming area. ·Enter headfirst only when the area is clearly marked for diving and has no obstructions. 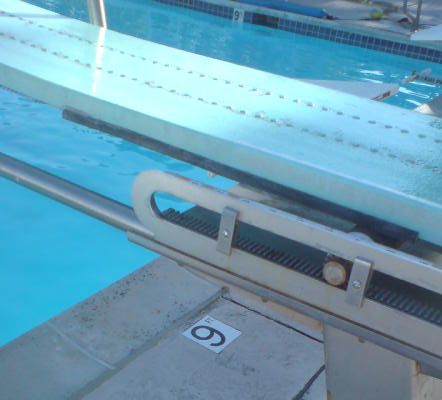 (from the Red Cross Water Safety Instructor’s manual, 2009) Minimum depth of water under a 1 meter diving board directly under the tip of the board should be 11 feet 6 inches. Minimum depth to teach diving from the side of the pool should be 9 feet. Goggles should never be worn during teaching of head first entries. This is from a page of more potential diving board and slide rules. Good swimmers are likely to think they don’t need a lifeguard. Some people are even offended at having to follow supposed safety rules. If they have done dangerous things before and not been hurt they are likely to want to be able to continue the same fun things. 1) The familiarity effect; people who have done a lot of diving with no harm are less likely to comply with warnings. If your personal experience is that it has been safe for you, you gauge your future risk as low. Swim team members are among those most likely to ignore a warning sign. This can be affected as well by never having known anyone who was paralyzed by a diving accident. Younger people in general do not have as many life experiences that tell them that warning signs might be valid. 2) People who are aware of a hazard decide they can minimize risk by trying to be safe. A diver knows that the water is shallow, but decides to try to attempt a dive with a shallow trajectory. Unfortunately, you have little control over dive angle. 3) Everyone else is doing it. If some people are diving where they should not it is more likely that others will as well, even with signs warning them not to. Some people are risk takers and are willing to risk the consequences. Disability and even death can result from a poorly done dive, but these results do not seem as likely to some people as to others. Some people don’t like to have their behavior limited by orders from the manufacturer of a product or the manager of a pool. Diving boards seem to invite more risky behavior and have even been shut down at some pools. Only one bounce allowed on the diving board. jumping or diving has done so, and should not approach the end of the board until the swimmer is clear. Don’t run on the board or attempt to dive a long way through the air. Swim away from the board immediately after diving so you aren’t a hazard for the next diver and so you are safe if the next diver doesn’t make certain the water is clear. Jump or dive only from the end of the board. Don’t use the guardrails for gymnastics. Trick dives only with permission. Do not mix alcohol with swimming, diving or boating. Alcohol impairs your judgment, balance, and coordination, affects your swimming and diving skills, and reduces your body’s ability to stay warm. Water depth must be at least 9 feet when learning head-first entries from the deck (or deeper if state or local regulations require). You should be physically and psychologically ready to do the skill. As you go along through the steps of learning to dive, if you find yourself unable to do a next step you should practice the preceding step until you gain confidence. You should be able to demonstrate correct hand, arm and head position before trying to do a head-first entry. One way to do this would be to hold the arms over the head and in line with the body on a forceful push and glide from the pool side under water. Shivering is your body’s attempt to warm you up when you have gotten too cold. Don’t ignore shivering, it is a symptom of hypothermia, a general body cooling that develops when your body can’t generate enough heat to maintain normal body temperature. Air or water temperature does not have to be that cold to cause hypothermia. Recognize the symptoms of serious hypothermia: confusion, dizziness, exhaustion, a glassy stare, apathy and decreased levels of consciousness and/or severe shivering. Seek medical attention immediately if you have these symptoms. Hypothermia is the number one killer of people in the out-of-doors. ·Drink plenty of water regularly and often even if you do not feel thirsty. Your body needs water to keep cool. Avoid drinks with alcohol or caffeine in them. They can make you feel good briefly but make the heat’s effects on your body worse. This is especially true with beer, which dehydrates you. ·Watch for signs of heat stroke: Heat stroke is life-threatening. The victim’s temperature control system, which produces sweating to cool the body, stops working. The body temperature can rise so high that brain damage and death may result if the body is not cooled quickly. Signals include hot, red, and dry skin; changes in consciousness, rapid, weak pulse, and rapid, shallow breathing. Call 9-1-1 or your local EMS number. Move the person to a cooler place. Quickly cool the body by wrapping wet sheets around the body and fan it. If you have ice packs or cold packs, place them on each of the victim’s wrists and ankles, in the armpits and on the neck to cool the large blood vessels. Watch for signals of breathing problems and make sure the airway is clear. Keep the person lying down. ·Wear eye protection: Good sunglasses are like sunscreen for your eyes and protect against damage that can occur from UV rays. Be sure to wear sunglasses with labels that indicate that they absorb at least 90 percent of UV sunlight. Protect your skin: Sunlight contains two kinds of UV rays — UVA increases the risk of skin cancer, skin aging, and other skin diseases. UVB causes sunburn and can lead to skin cancer. Limit the amount of direct sunlight you receive between 10:00 a.m. and 4:00 p.m. and wear a waterproof sunscreen with a sun protection factor (SPF) containing a high rating such as 30, 45 or even 60. SPF 5 is a joke. Apply the sunscreen according to the directions; with many you can’t apply them and get in the pool right away or they will just wash off and make an oil slick in the pool. · Select an area that has good water quality and safe natural conditions. Murky water, hidden underwater objects, unexpected drop-offs, and aquatic plant life are hazards. 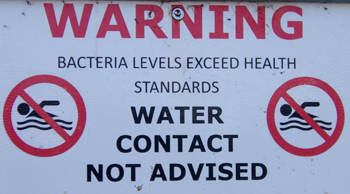 Water pollution can cause health problems for swimmers. Strong tides, big waves, and currents can turn an event that began as fun into a tragedy. ·Make sure the water is deep enough before entering headfirst. Too many swimmers are seriously injured every year by entering headfirst into water that is too shallow. A feet first entry is much safer than diving. ·Avoid drainage ditches and arroyos. 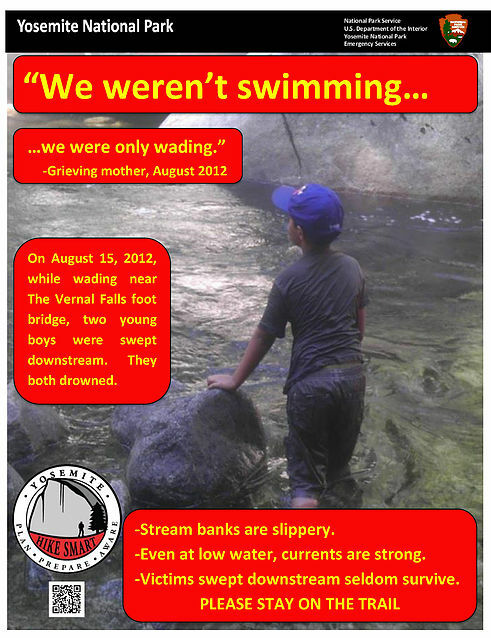 Drainage ditches and arroyos for water run-off are not good places for swimming or playing in the water. After heavy rains, they can quickly change into raging rivers that can easily take a human life. Even the strongest swimmers are no match for the power of the water. Fast water and debris in the current make ditches and arroyos very dangerous. Your abilities as a surfer do not translate to ability in a strong river current. Don’t turn your back on the ocean , big waves can sneak up on you. 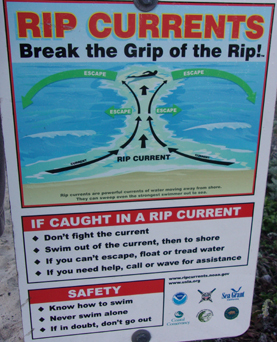 Read more at: rogue or sneaker waves, which also has rip current safety links. ·	Wear foot protection: People’s and dog’s feet get burned from the sand or cut from glass in the sand or burnt from coals of a beach campfire that was not put out completely. ·Stay within the designated swimming area, ideally within the visibility of a lifeguard. ·Check the surf conditions before you enter the water. Check to see if a warning flag is up or check with a lifeguard for water conditions, beach conditions, or any potential hazards. 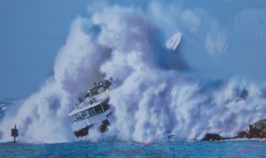 ·Stay away from piers, pilings, and diving platforms when in the water. ·Keep a lookout for aquatic life. Water plants and animals may be dangerous. Avoid patches of plants. Leave animals alone. ·Make sure you always have enough energy to swim back to shore. ·Don’t try to swim against a current if caught in one. Swim gradually out of the current, by swimming across it. Beach sand can be full of E.coli bacteria. Wash your hands after digging in the sand and making sand castles. Get on top of an over-turned boat or any wreckage ! Heart failure is the usual cause of death when the core temperature cools to below 30 degrees. The body loses heat to the water about 30 times faster. To conserve body heat while awaiting rescue in cold water, use the HELP position – the heat escape lessening posture. When two or more people wearing life jackets find themselves in cold water, the huddle position will help them conserve body heat while awaiting rescue. 1.Draw your knees up to your chest. 2.Keep your face forward and out of the water. 3.Hold your upper arms at your sides, and hold your lower arms against or across your chest. 2. With three or more people, put your arms over each other’s shoulders so that the sides of your chests are together. Children or elderly persons should be placed in the middle of the huddle. 1) float downstream on your back with your feet in front of you. This will help you fend off rocks and avoid trapping your feet. 2) Swim toward shore or into an eddy” … “(the sheltered area behind or downstream of an obstruction, where the currents flow upstream toward the obstruction)” …”as soon as it is safe to do so. If you are close to shore, if the water is cold, or if there are hazards further downstream, consider swimming toward shore. –In shallow water, swim on your back at an angle against the current and toward shore. –In deep water, swim on your front at an angle against the current and toward shore. 3) Do not stand up, you could catch your foot at an angle under a rock and become entrapped and pinned, even in just a few feet of water. –hold on to a grab loop” (or other rope built into the raft), “keeping the craft in front of you. –stay on the upstream end of the craft to avoid being caught between the craft and a rock. see also Grand Teton trip kayaking.